Time for another game to break, this time Video Pinball went faulty mid game all of a sudden there was no video image on the display, upon re-powering the game the was a high pitched ping from the speaker and nothing else visible on the display, all the play field LED's were also not illuminated. I first checked the Reset line on the CPU, this was low, you would usually see it held high in working condition and pulsing high/low if the game was resetting or more commonly mentioned watchdogging. Next up I needed to check the clock circuit and see if all the horizontal and vertical timing signals were present. If these aren't all correct and present the game wont even get as far as attempting to run. The main 12MHz clock signal was good and all the horizontal timing signals from the outputs of LS161's at N6, M5 and L5 were all correct and present. It was time to scroll down page 4-5 and look at the horizontal timing signals. 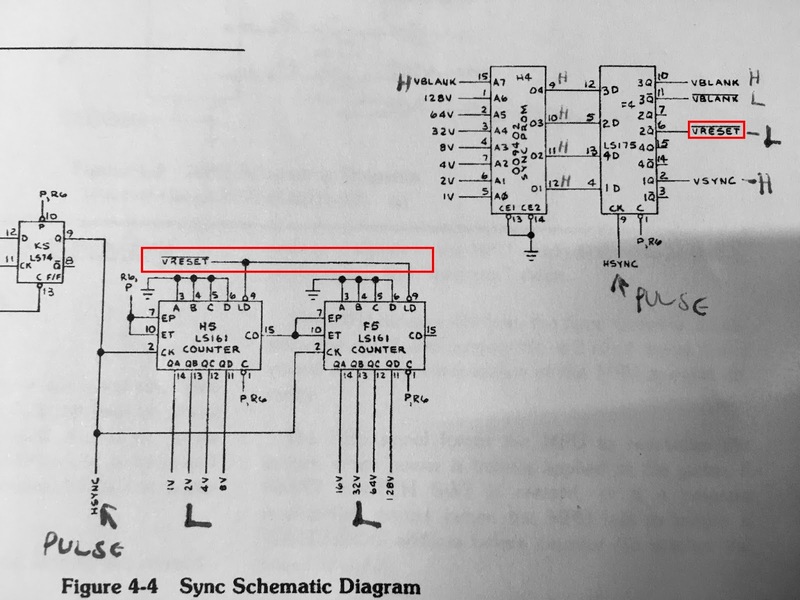 As I noted on my printed schematic, all of the vertical output signal were low, these should be seem to be pulsing on a logic probe, I noted that the *VRESET signal was low and incorrectly thought the LS161 at N5 would have been faulty. I removed this from the PCB and tested it and was proven wrong, it was OK. I should have studied the data sheet further, the way these LS161's are used in the circuit requires a state change on pin 9. 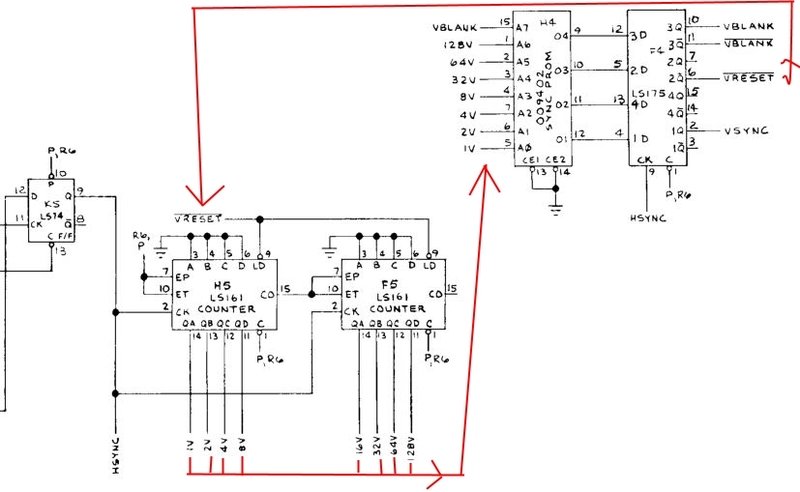 The circuit creates a loop where the output signal *VRESET from pin 6 of F4 is needed to make the vertical timings active which in turn are used via a PROM to generate the *VRESET signal... confusing or what! 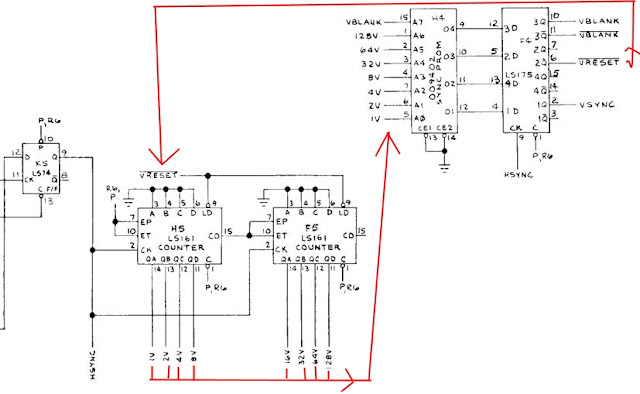 The above image shows the signal flow of what I tried to explain. Moving on I manually forced the *VRESET signal high whilst monitoring the vertical outputs on my logic probe, it would get high outputs on the vertical clock signals and would then hear the game reset. Next I decided to remove the LS175 from F4 and test it. I was running out of IC's which could be at fault! 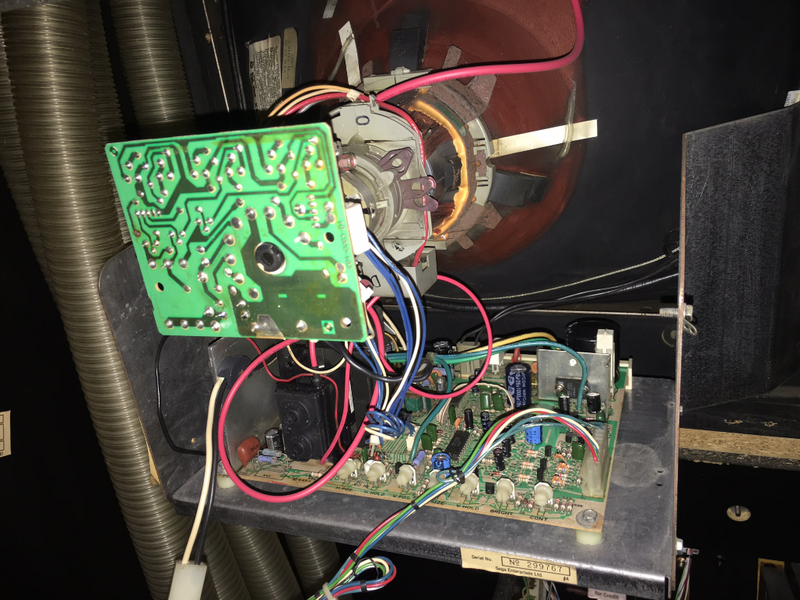 :o) This turned out to be fine which should have left me with the 'SYNC PROM' at H4 being the problem, I had no easy way to test this so I removed a similar PROM from my Fire Truck cab and fitted it to newly installed IC socket and boom the game was running again! I have sourced the correct PROM and one of my arcade buddies has programmed it, so once I collect it i will be able to consider the game fully working again. For future reference if anyone finds this post while looking for Video Pinball or Fire Truck repair logs, the SYNC PROM in my Video Pinball cab is labelled 9402-01 and the SYNC PROM in Fire Truck is labelled 9114-01. Using these files from MAME they contain exactly the same data and should be fully interchangeable between these two game and possibly any others of the era that use the a PROM to generate the Sync timings.